My mom was an amazing baker-extraordinaire, and most of my favorite childhood memories revolving around Christmas involve baking cookies. It never got old, and whether we were decorating melt-in-your mouth sugar cookies with piping of all colors and styles or gluing on the perfect accessories to our gingerbread men, I loved it. It formed a bond with my mom that we will both cherish forever. Even now, 20+ years later, when December hits, all I want to do is go home, turn the Christmas music up, the oven on, and bake cookies with mom. Part of the intrigue after the piles and piles of cookies were baked and decorated to child-like perfection was the finale: when we got to create a plate for Santa. Of course, Santa can eat everything and multiples of it, so we always had a giant plate and we put at least two of everything we had made on that plate. I was very protective of those cookies. No one (especially not a sneaky brother) was going to touch any one of them. They were for Santa and Santa alone. And, first thing Christmas morning, it was a mad dash to make sure that Santa had eaten them all, drank his milk and left just the appropriate amount of crumbs behind. He never failed me. This year, I encourage you to bake cookies with your children. What better way to spend a Sunday afternoon than in your kitchen with flour flying and little fingers dipped in red sugar crystals? Play some of your favorite music and show your kids a new kind of Christmas magic. I guarantee that you won’t forget it and neither will they. And, after all, do you really think Santa prefers homemade cookies or those pre-packaged, cardboard cutouts? I’d venture to say he’d rather your child’s attempt at a cookie (regardless of what it tastes or looks like) than anything else. If you’re at a loss for where to start, try the sugar cookies above. It’s a very simple recipe that my mom and I are both in love with. It’s called a sugar cookie, but don’t let that fool you. It’s got sour cream that makes it to-die-for, and I’d describe it somewhere between shortbread and sugar cookie. Plus, while the mixing and baking is fun, there’s something about decorating cookies after that I believe absolutely every child should be a part of. P.S. Don’t forget the milk! 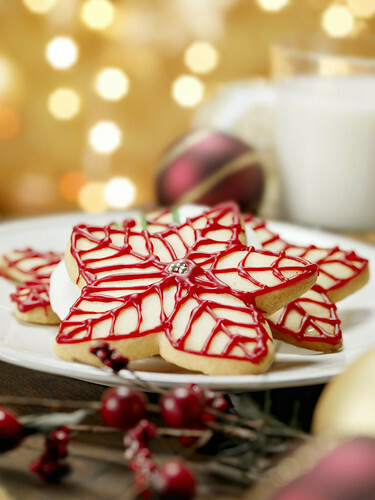 Here are some more Christmas Cookie recipes that Santa will love! This article is written by Tara Alley, who is a freelance writer from Big Sky, MT, a passionate baker and a lover of all things coffee-related. She is now living in the heart of Orange County, CA, working for Coffee Home Direct, promoting coffee makers and coffee accessories. You can reach her at: tara@coffeehomedirect.com. Great post!! Cookies it is at X'Mas!! Santa would be elated to see such creative designs. awesome work and perfect cookies. gr8 post cookies are decorated for santas suparb. Loved hearing about your holiday memories! Baking cookies is a great past time of ours as well! Great job on the cookies, they look awesome! By the way, I am currently running sweepstakes on my food site for a dozen of home-baked Slovak Christmas cookies, if you would like to enter. The URL to enter is http://www.slovakcooking.com/2010/blog/xmas-cookies/ Slovak Christmas cookies come in all sorts of shapes. I'll makes some 5 or 6 different kinds. Great job for the cookies. Looks delicious thanks for sharing. Beautiful cookies. My first time here & I must say I am enjoying myself.